Shakthi’s cosmic dance | Hava Nagila! On Teaching – By Shri.R.Narayanan, BA, BT, Retd Headmaster. Musings on Life and Death – By Shri.A.Ramanathan, Mysore. Heritage Governance – By Dr.S.Rammohan, IRAS Retired. It’s a 6! Score – 150*! 5 Years, 110 posts, 5000 visits! Siva is my favourite deity. I am not a true Shaivaite, not even a false Shaivaite but of all the stories that I have heard and I have heard plenty, I love the story of Neelakanta. During the churning of the ocean, many things appeared from within. Everyone was interested in what they wanted and took it. But, when the aala kaala visham appeared, they all ran helter-skelter. Siva drank it. His consort, Shakthi, who I consider the best part of Siva, was even more concerned for the world and stopped the poison from entering his system. It stopped in his throat, giving it a blue colour, earning him the name Neelakanta. I like Siva because he alone was prepared to die for the world’s welfare. He did not go after the riches that came out of the ocean nor was he interested in its final product – the Amrutha. He took the deadliest thing upon himself, for the greater good – a true Yogi, a true God! Everytime Siva is happy or angry, he does the Thandava, the cosmic dance. 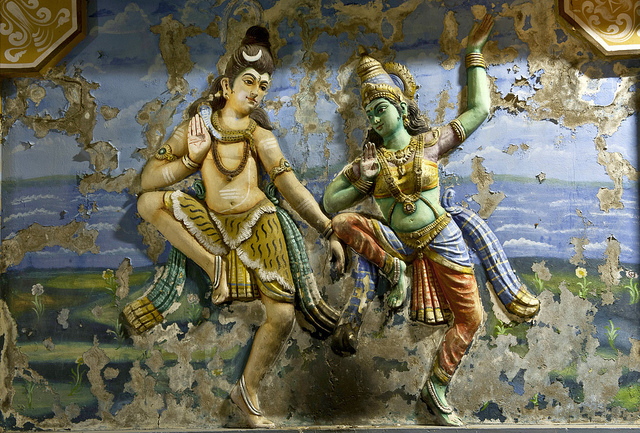 This dance is said to be the beginning of the universe according to Shaivaite philosophy. It is also said to mark the end of the universe. Let me attempt to put into words Siva’s cosmic dance and its relation with the latest sensation – no I am not talking of Justin Beiber – the Higgs Boson. 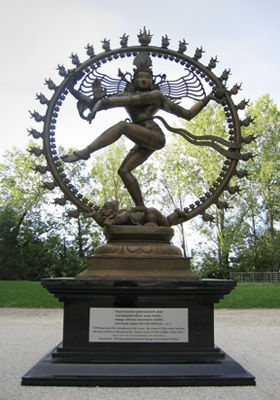 On June 18, 2004, the Government of India presented a large statue of Nataraja to CERN, where it currently holds a special place. A plaque next to the statue contains several quotes from The Tao of Physics, acknowledging the unique relationship between Siva’s cosmic dance and the dance of the subatomic particles as analyzed by CERN’s physicists. It is the best metaphor they could get to symbolize their work. Capra discussed this metaphor way back in 1972 in Main Currents in Modern Thought in an article titled “The Dance of Shiva: The Hindu View of Matter in the Light of Modern Physics”. This parallel is also the central theme to his book The Tao of Physics published in 1975 and still continues to be a best seller with over 40 editions in print. Long before modern science came into existence, Indians have given shape to the dance of subatomic particles and woven a philosophy around it – namely Shaivism. It shows the heights of knowledge that existed at that time. They have discussed it in great detail and stated very clearly that this is the basis of life and also the basis of destruction. They have also stated that this is the basis to even nonliving things. This is now proved at CERN. Like the waves of the sea, the dance of these particles is ceaseless. Life and death is a continuous cycle. The subatomic particles form and die in millions every second. Needless to say, one of the greatest seers, Kanchi Mahaswamigal has discussed this in his Deivathin Kural. Excerpts can be found in the current (20/Jul/2012) edition of The Thuglaq. Amidst all this talk of Siva, one tends to forget Shakthi, the bestower of energy to Shiva. In lay terms, the woman behind the man. 🙂 It is in fact, the energy (Shakthi) that manifests itself as particles and dances. When energy (Shakthi) takes form, it becomes matter (Shiva). Devi Mahatmiyam, another old text, highlights the fact that it is Ambal who manifests herself as Brahma, Vishnu and Shiva, meaning that atomic energy is the sole cause of creation, existence and destruction!! With Shakthi’s divine dance, science basically has embraced Advaita. It is a wonderful unison of modern thought and ancient wisdom. 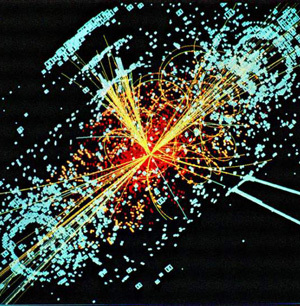 Whether the God particle or the God damned particle will really be found, what use it will be put to and what exactly its effects will be are left to individual imagination. For now though, we can revel in the dance of the divine mother and her consort. Thiruchittrrambalam!! Great Saints from the distant past down to Sri Narayana Tirtha, author of ‘Krishna Leela Tharangini’ have also interpreted Lord Krishna’s Kalinga narthana dance as symbolising creation, sustenance, and destruction. Whether Krishna, Shiva or Devi, our Seers felt the spiritual pulse of the universe aeons ago and it parallels modern science. 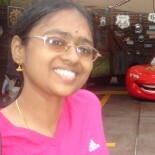 This entry was posted on July 13, 2012 by Meenakshi in Thoughts and tagged Advaita, CERN, Cosmic dance, Divine Mother, God Damned Particle, God Particle, Higgs Boson, Large Hadron Collider, link between Hinduism and Higgs Boson, Nataraja, Nataraja statue at CERN, Shaivaite Philosophy, Shaivism, Shakthi, Shiva, Siva.